Renowned horror novelist Mike Enslin (Cusack) only believes what he can see with his own two eyes. After a string of bestsellers discrediting paranormal events in the most infamous haunted houses and graveyards around the world, he scoffs at the concept of an afterlife. Enslin's phantom-free run of long and lonely nights is about to change forever when he checks into suite 1408 of the notorious Dolphin Hotel for his latest project, "Ten Nights in Haunted Hotel Rooms." Defying the warnings of the hotel manager (Jackson), the author is the first person in years to stay in the reputedly haunted room. Another bestseller may be imminent, but like all Stephen King heroes, Enslin must go from skeptic to true believer - and ultimately survive the night. 1408 proves that it’s still possible to make a very scary and creepy movie that is not populated by teenage characters or victims being mutilated. I guess it’s weird to use the word “refreshing” when talking about a horror movie, but that’s what 1408 is when compared to recent trends in the world of horror films. With the likes of the Saw series, Hostel movies and the upcoming Captivity, which all depend on scenes of excruciating personal torture to horrify the audience, I really enjoyed seeing an “old school” horror movie that was incredibly effective. 1408 is based on a short story by Stephen King (which I’ve never read but now plan on seeking out) about a jaded author who writes about haunted hotels but doesn’t believe in ghosts or the supernatural. Author Mike Enslin (played by John Cusack) goes all over the country, staying overnight at supposedly haunted hotels for inclusion in his books. Although he doesn’t believe in hauntings he brings with him a number of devices for registering such apparitions just in case. It becomes apparent quite quickly that Enslin is leading a rather empty life and has had some tragedy in his past that has left him as somewhat of an empty shell – jaded and going through the motions of living. He’s finishing up his research for the next book when he comes across a postcard sent to him anonymously informing him of room 1408 at the Dolphin Hotel in New York City. It’s phrased simply and intrigues him enough to do some research on it, and that’s when things get interesting. 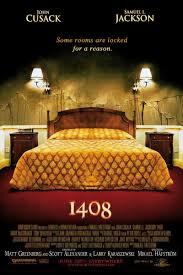 It turns out that in room 1408 there have been dozens of deaths over the years, and the hotel’s general manager (played by the ever-excellent Samuel L. Jackson) absolutely refuses to allow anyone to stay in the room. Enslin resorts to legal action to get in the room and even then the manager tries his best to talk him out of it, but to no avail. The final warning to Enslin is that no one has lasted more than one hour in the room, nevermind an entire night. The cocky and very skeptical Enslin gets to the room and finds nothing remarkable about it, at least for the first 5 minutes or so, but as you can guess things soon change. A lot. The film hinges on the performance of the actor playing author Mike Enslin, and luckily the awesome John Cusack was chosen for the role. For the majority of the film it’s a one-man show, with a tape recorder used as a device to allow Cusack to talk to himself without sounding like he’s going crazy. I’ve always enjoyed Cusack on-screen and this film was no exception. He has an everyman quality that is totally believable and his sense of quiet desperation really comes across early in the film, as does his fear and despair (I won’t get into details as to not spoil it for you) midway through the film and through to the end. There was a bit of graphic gore in the film, but only in still black and white photos. What really gets to the viewer is the sense of dread and fear of what will happen next. Very nicely done and very effective. I didn’t give it a higher rating because for a while there I thought it did slow down a bit too much, plus while not enough to ruin the movie by a longshot, the ending left me with some questions regarding one of the characters, and that one character’s situation is the one that sticks with you after you leave the theater. It’s also the primary reason I’d like to read the story the film was based on to see if there’s any clarification there. In the end a very effective creepy movie, perfect for date night as it will no doubt have your girlfriend/wife clinging to your arm and it’s not gore-filled enough to turn her off from the film. Oh yeah, and don’t be an idiot like a number of parents at the screening I watched and bring your 4 or 5 year old to this. Although not excessively gory it’s plenty scary.